New research shows that macaques have a vocal tract capable of emitting human-like speech, but they lack the brain circuitry to make words happen. That may be a good thing, because their simulated speech is creepy as hell. For nearly four decades, scientists have thought that the inability of nonhuman primates to produce human speech sounds had to do with anatomical limitations in their vocal tracts. Autopsies done on monkey cadavers seemed to indicate a very limited vocal range compared to humans. A new study published in the journal Science Advances suggests this thinking is wrong, and that at least one monkey, the macaque, possesses the vocal anatomy to produce clearly intelligible speech. As the Princeton Neuroscience Institute researchers point out in their paper, the apparent inability to produce human sounds has more to do with limits to monkey brain power. To show this, neuroscientist Asif Ghazanfar and his colleagues investigated the range of movements that the macaque vocal anatomy could produce. 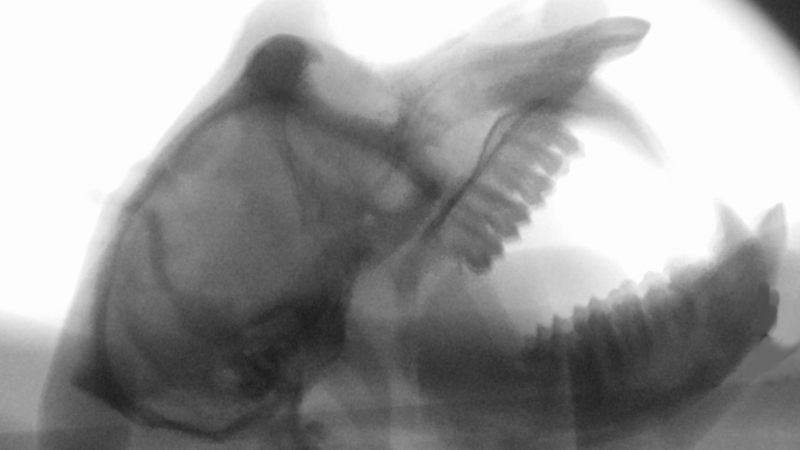 The researchers used X-ray videos to capture and then trace the movements of the different parts of a macaque’s vocal anatomy, including the tongue, lips, and larynx, as the test subject made various sounds and facial movements. Scientists at the VUB Artificial Intelligence Lab in Belgium fed this data into a computer model capable of predicting and then simulating a macaque’s vocal range. Human speech is produced by the larynx, which is changed by the position of other vocal anatomy, including the lips and tongue. For example, think about how your face changes when you say the words “bat” and “bot.” Macaques, this research suggests, have this same capacity. The researchers suspect that the presence of a human-like vocal tract in an old species like the macaque suggests that other primates, including apes like the chimpanzee, have one as well. It may very well be a good idea to study chimps to see if they have certain neural networks that their monkey cousins do not, and to compare any differences to humans. Consequently, primates could be used as models for understanding early human speech development and human speech evolution. The answer to this question may not be simple. Human speech, along with the attendant capacity for language, involves a huge number of mental capacities, such as the ability to convert an object or concept into a word, the application of grammar, and the capacity for recursive language in which concepts are embedded within concepts. Humans and primates share a lot in common, but when it comes to our use of language, we’re clearly set apart.